“The Mammoth Book of the Beatles” contains a LOT of information across its 594 pages. 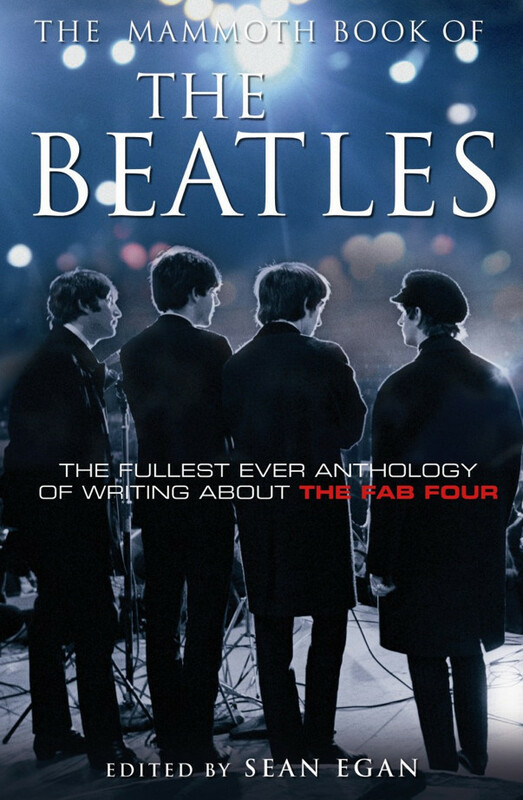 This is a compilation book edited by Sean Egan who has gathered together more than 30 contemporary accounts, articles, and interviews about the Beatles (from Maureen Cleave’s “Beatles Bigger than Christ” feature, to their debunking in the News of the World just before the release of “Sgt Pepper”. Hmmm. Good timing News of the World. It was a dodgy newspaper back then, too). There are also latter-day memoirs and re-assessments. Contributors include Paul Gambaccini, Dave Marsh, Greil Marcus and Alan Clayson. There’s also a short section on the Beatles cartoon series – written by Mitch Axelrod (from the Fab Forum radio show and podcast). The book also includes reviews of each album and single release, interviews, and a comprehensive Beatles and solo Beatles UK discography. Published by Constable and Robinson in the UK, and by Running Press in the US. I have the US paperback edition that came out in 2009. There’s a pretty good review of the book here by blogger David Marx. This entry was posted in Beatles, Beatles Books, Uncategorized and tagged Beatles, Beatles Books, Music by beatlesblogger. Bookmark the permalink.